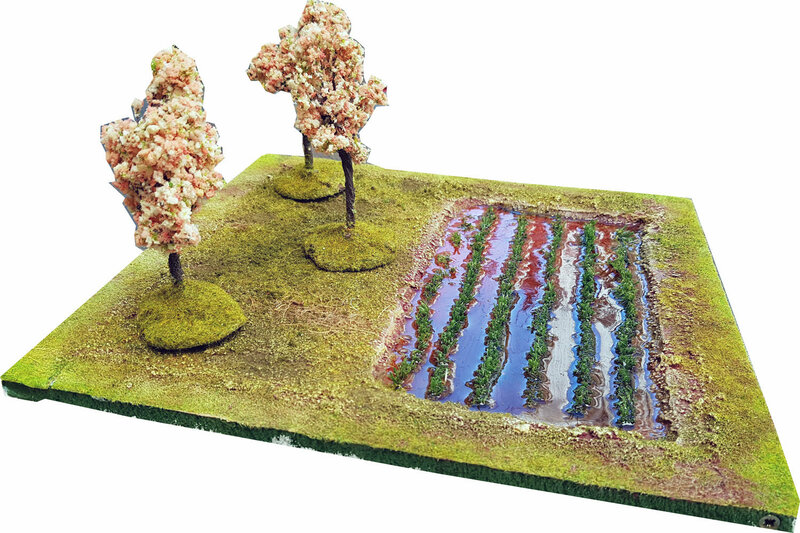 Enhance your terrain set with a 30x30cm Rice plantation tile, with a recessed Rice field and magnetic Cherry blossom trees! Each Tile is 30cm x 30cm (1' x 1') and 1cm deep; the majority are made from polystyrene and PVC, with Resin extra pieces. The tile displays two actual fields. The "sunken" rice field shows a flooded paddy field with seedlings emerging. The water is depicted with layers of liquid glass to a stunning effect. There is the option to cover the full tile with Rice fields, so that there will be two rice fields and no dirt area. The tile comes with 3 Cherry blossom trees. Players can use the dirt field as flat ground, or connect the provided features any way they want. They can create n orchard, in combination with the rice field. You can forgo the 3 Cherry blossom trees, or extend the rice plantation to the full tile (in this case, there will be no trees included). When miniatures move through the terrain, the magnetized features can be removed temporarily, to allow placement of units without any fuss.